Combine the herbs, sour cream, lemon juice, vinegar, and salt and pepper. Adjust to taste. 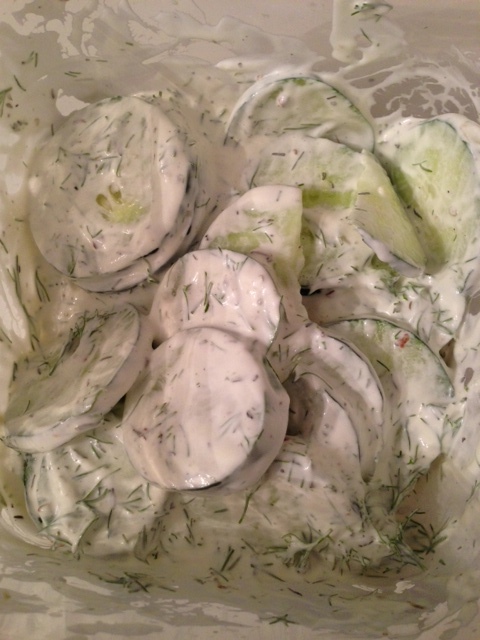 Stir in cucumbers, ready to serve immediately or refrigerate until ready to eat. I made this with 1 1/2 cucumbers and still had some dip remaining that I ate with carrots. So this recipe is definitely liberal enough to add some additional vegetables or more cucumbers. You could also just serve the sour cream with the herbs as a vegetable dip on a veggie tray. A vegan blogger that I follow made a vegan variation of this recipe with radishes in it too. I also found some fun facts about cucumbers I recommend you check out! They can eliminate bad breath, be used to erase pen and crayon marks, and even prevent a hangover!